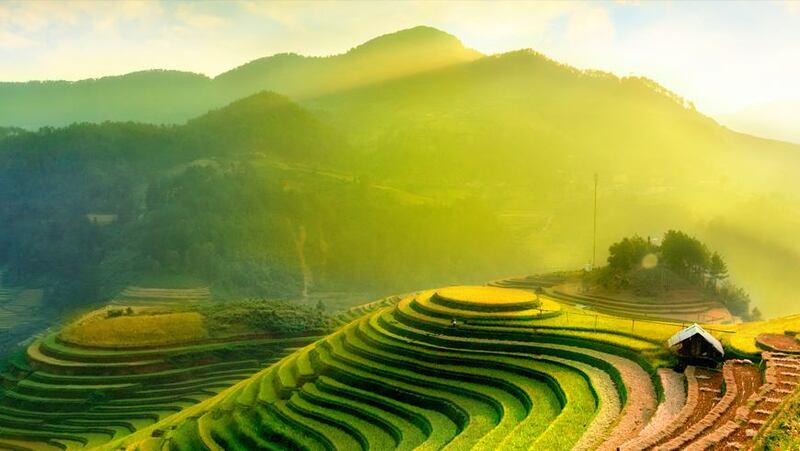 Rice fields on terraces of Mu Cang Chai, YenBai, Vietnam. Anyone seeking to assess the impact of the GEF's work in Vietnam should go and visit Mr. Phan Trong Xuan. He used to live within five metres of a Persistent Organic Pollutant (POP) pesticide warehouse in Mau 2 village, Kim Lien commune, in the Nam Dan district of Nghe An province The pesticides caused soil and water pollution, and produced a bad odour that pervaded the whole village. Many people suffered health problems: some died from cancer. The GEF/UNDP Building Capacity to Eliminate POP Pesticide Stockpiles in Viet Nam Project (2010-2015) helped to remove the pesticides in Mau 2 village, one of its demonstration areas. Both the quality of the environment and human health has improved. The project has has national, as well as local effects, properly treating nearly 1,000 tonnes of seriously contaminated soils nationwide. This is just one example of how - thanks to the support of the GEF in Viet Nam - many of the country's serious environmental problems have been gradually addressed. Strengthened policies and legal frameworks addressing illegal wildlife consumption - and increased awareness of the need to change behaviour – are another result of successful GEF support, this time via GEF/WB Project (2012-2015) Wildlife Consumption in Vietnam: Reforming Policies and Practices to Strengthen Biodiversity Conservation. This project has helped to establish and coordinate a partnership of government ministries, local and international NGOs, the private sector, socio-political organisations and communities, to increase support for efforts to reduce the practice. Thus GEF projects have supported the formulation and promulgation of national policies – like the policy on POP pesticides and legislation on wildlife consumption - consequently contributing to global environmental benefits. And these two examples make up only a very minor proportion of the GEF’s contribution to the sustainable development of Viet Nam. Since 1991, Viet Nam has implemented 53 small, medium to large-size projects of about 135 million USD and participated in 45 regional and global ones. Though not a big GEF portfolio country, it has set out a strategy on how to use and mobilize GEF resources most effectively. This includes: tackling the root causes of environmental degradation; multiplying best practices; supporting innovative and scalable activities; mobilizing the support and participation of the whole society; institutionalizing policies; delivering the greatest impacts and performing cost-effectively – while implementing locally feasible solutions with national and global incremental impacts. Achieving the promise of climate change agreements and the Sustainable Development Goals will be more challenging unless urgent actions are taken. GEF resources are very important in helping Viet Nam – a developing country, heavily affected by climate change - to take such measures to implement its global commitments and to sustain both its environment and its development.